A behind-the-scenes depot tour, trip through the vehicle wash and fuel bay and private bus journey were on the lesson plan for a group of autistic schoolchildren from Benwell recently. 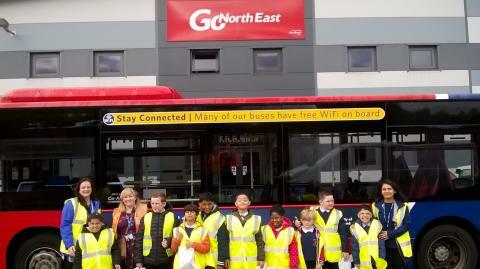 The youngsters, aged between six and 10 from Atkinson Road Primary Academy in the West End of Newcastle, were guest of honours at Go North East’s Riverside super-depot in Gateshead. 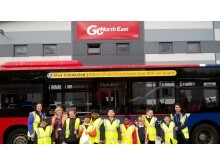 With a passion for public transport, the eight pupils began their visit after being picked up for an exclusive journey around Newcastle in one of Go North East’s high specification vehicles, before arriving at Riverside. 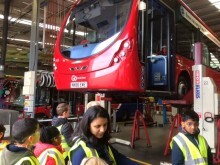 With the aim to learn how to stay safe in the community, the children were given a VIP behind-the-scenes tour of the depot, including a visit to Go North East’s service delivery centre which uses new technologies such as real-time tracking and roadworks intelligence to enable bus services across the region to operate reliably and safely. Complete with high-visibility jackets and earplugs, a stop off to watch the engineers at work, showed the children where health and safety adjustments are made to buses ahead of their journeys. The visit ended with the group enjoying a ride through the fuel bay and bus wash, before being presented with a Go North East goody bag each to remember the day. Mrs Janice March, 7M class teacher, who teaches at the school’s specialist provision for children with autism, said: “The class was learning about our community with a focus on how we can keep ourselves safe, both at home and when out and about. Public transport seems to really appeal to the class, as children with social communication difficulties learn best when they can physically see and do things.